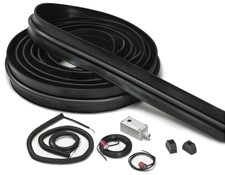 A pneumatic sensing edge system is strongly recommended for high foot-traffic or vehicle-traffic areas. It is equipped with a hose installed in the weatherstripping at the bottom of the door. The system reverses the movement of the door if the door hits an object. Light contact with the hose is enough to activate this sensitive system. It is connected to a take-up reel (if the door is 12 ft / 3.7 m or over in height) or a coil cord located beside the door. It is suggested to install a photoelectric-eye system with this pneumatic sensing edge system.